Phoenix mayoral candidates disagreed over the controversial Phoenix Suns arena deal during a debate hosted by KJZZ Tuesday. 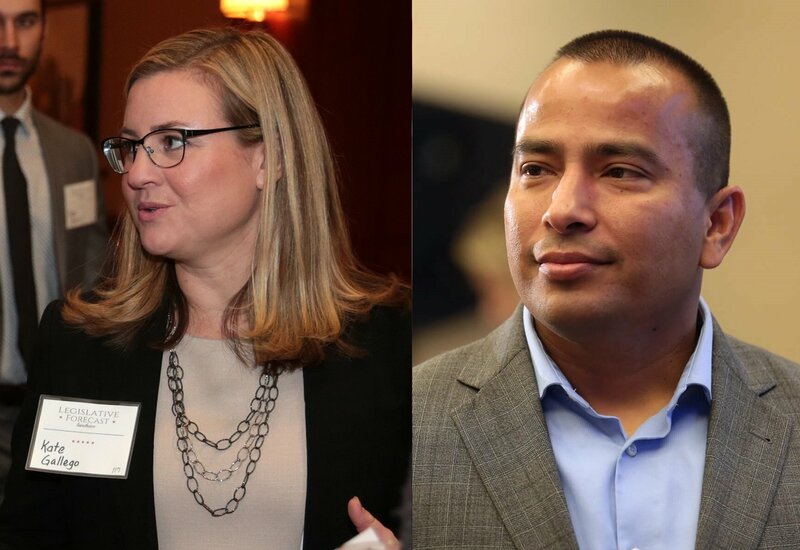 Kate Gallego said she doesn’t think city money should be used to subsidize professional sports venues, while Daniel Valenzuela argued the facilities are economic drivers. Valenzuela said the Talking Stick Resort Arena, the downtown arena that is home to the Phoenix Suns and hosts dozens of concerts and other events, is an economic anchor for the city, that employs more than 1,000 people and works with more than 100 local businesses. If the city didn’t make a deal with the Phoenix Suns, he said the arena would become blight. “Take a look at the Veterans Memorial Coliseum, imagine having that in downtown Phoenix,” Valenzuela said. Phoenix, which built the arena, has spent about $80 million on the facility since 1989 and the Suns have spent $150 million, according to The Arizona Republic. Under the Jan. 23 deal, the Suns will pay $80 million plus all cost overruns for renovations and the city will pay $150 million in arena renovations with money from the Sports Facilities Fund. That fund was created in the late 1980s to fund the arena and promote tourism in downtown. It’s funded by a taxes on hotels and rental cars, and is mostly paid by tourists. Gallego suggested the tourism tax revenue could go to investing in public safety staffing or to address needs around homelessness, instead of funding the sports arena. “We cannot promise that growth will take care of all of our needs. So, we have to prioritize,” Gallego said. Valenzuela rejected Gallego’s suggestion and said the tourism tax should be used for the arena project it was intended for. “That’s what gives government a bad name, we are taxing someone for one purpose and using it for a different purpose,” he said. The city council can designate what the Sports Facilities Fund will be used for, according to the city website. Gallego was the top vote-getter in a four-person race in November, winning 45 percent of the vote. Valenzuela finished a distant second, with 26 percent of the vote. Because no one got a majority of votes, Gallego and Valenzuela face each other in a March 12 run-off. In-person early voting is available until March 8 on the 15th floor of Phoenix City Hall. District 5, which covers west Phoenix, and District 8, in south Phoenix, Laveen and parts of central Phoenix, will also elect councilmembers. Gallego was first elected to the City Council in 2013, and Valenzuela became a councilmember in 2012. Both resigned their council seats last year to run for mayor. During the one-hour forum held at Burton Barr Central Library, the candidates also touched on issues on water infrastructure, climate change, and the light rail. Gallego and Valenzuela both said they support the light rail as a transportation option and back the South Phoenix light rail extension – which stirred controversy over community outrage on the plan’s lane reduction. Now, it will be up to voters to decide the future of light rail in Phoenix. The mayoral candidates also talked about sustainability and climate change. Both agree there should be more solar energy, shade and walkability in the city. “We want to be the most sustainable desert city,” Gallego said. Valenzuela said expanding programs like recycling is also good for the economy. “It’s what people expect out of the fifth-largest city in the country,” he said. Throughout the forum, Valenzuela leaned on his personal experiences for what will guide him as mayor. Gallego focused on sharing examples about her accomplishments on city council. “I want to fight for a city where regardless of where you live you have access to the best arts and culture, the best parks, the best library and that you feel safe,” Gallego said.